Breckenridge Grand Vacations employees are very committed to the conservation and sustainability of the town they live in. On four days each year, Breckenridge Grand Vacations employees partner with the Adopt-a-Trail Program of the Friends of the Dillon Ranger District to work to maintain the Peaks Trail that begins just behind Grand Lodge on Peak 7, with 40-50 employees participating annually. Since 2011, BGV has donated $15,500 to FDRD to support this trail preservation work. For many years, Breckenridge Grand Vacations and the Friends of the Dillon Ranger District (FDRD) have partnered to improve a variety of mountain trails in the National Forest in the Breckenridge area and this summer is no exception. FDRD manages volunteers who contribute thousands of volunteer hours each year maintaining and improving trails, planting trees, pulling invasive weeds, educating forest visitors and much more. 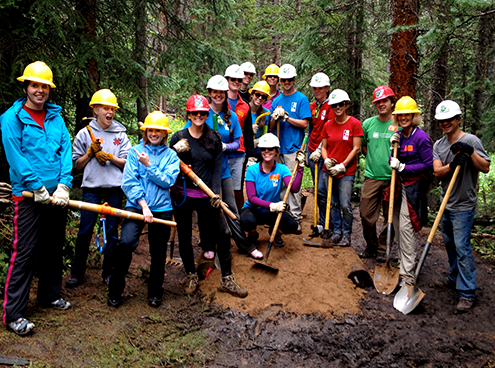 Four trail work days have been specifically designated for BGV employees to work with other volunteers in the community maintaining some of the busiest trails in Breckenridge. This year, the BGV trail work days are July 26, July 30, August 19 and September 7. Community members and resort guests are always welcome to join our volunteer work days. Following the work day, which typically lasts from 9 a.m. – 1 p.m., BGV Gives hosts a BBQ lunch for all volunteers at the Lodgepole Bar & Grill at Grand Timber Lodge. Currently, 57 Breckenridge Grand Vacations employees and family members have signed up to volunteer at one or more trail work days. For more information about all of the volunteer opportunities at FDRD as well as trail and educational event information, contact fdrd.org.